Welcome to the Center of the Universe. Stand at the center of the Center of the Universe ( Guidepost to the Center of the Universe shown to the left is located at N 35th, Fremont Place N & Fremont Ave N ). Visit the Troll who turned to concrete just before snacking on a Fahrvergnugen. Gaze upon our Soviet-era Rocket. Shake a finger with Lenin ( Vladimir, that is ). See what creative costumes have befallen the Waiting for the Interurban statue. 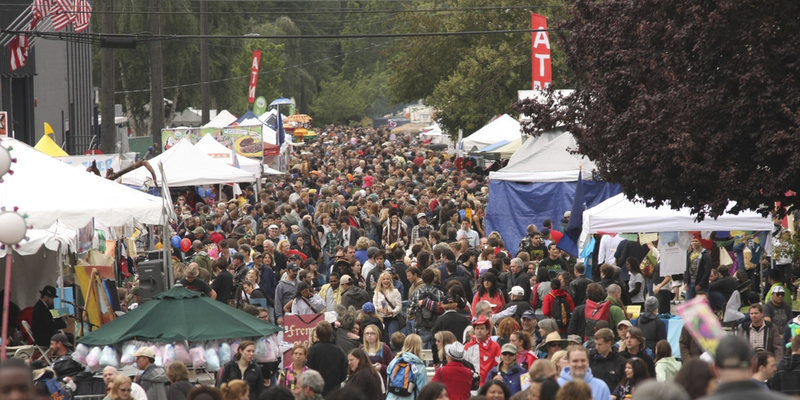 Every Sunday Fremont boasts the oldest outdoor street market, The Fremont Sunday Market: with quirky finds and delectable bits this is an event unto itself. On the First Friday of each month enjoy a creative stroll around the galleries and shops participating in Fremont’s monthly artwalk; every first Friday, rain or shine. Throughout the year, Fremont hosts Seattle’s most creative festivals including the Moisture Festival, HopScotch, Fremont Fair and Solstice Parade, Fremont Outdoor Movies with our annual Zombie Walk, Music in the Sculpture Garden, Family 4th at Gasworks Park, Northwest Lovefest, Fremont Oktoberfest and Lenin Lighting… and so many more block parties, pub crawls and boutique extravaganzas. Witness outlandish sights – from painted cyclists to zombies and from chainsaw pumpkin carving to art cars. And it all happens amidstincredibly unique locally, based shops and delicious, distinctive eateries. Food truck event enterprise Mobile Food Rodeo is bringing back Winter Feast for its second year, joining forces with the Fremont Sunday Market on November 17 to gather up more than 20 food trucks and 10 breweries, even though summer is a thing of the past. The list of food trucks is impressive and includes Marination, Ezell's Express, Barking Frog, and Where Ya at Matt. 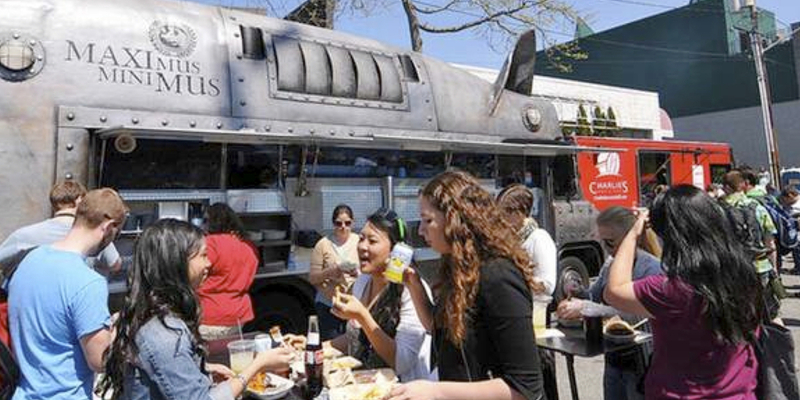 A red wine–braised rabbit pozole with winter vegetables will come from the Nosh food truck. The creamy butternut squash and sage soup with duck confit from Evolution Revolution will warm you up quite nice. On the sweeter side, Street Donuts is making a cinnamon-spiced donut with a pumpkin drizzle. Ten local breweries will show off their seasonal winter beers. Look for Fremont Brewing with its Abominable Ale, Maritime Pacific with good ol' Jolly Roger, and Hale's Ales pouring the Wee Heavy. Hilliard’s, too, with its Extra Special Belgian, even though the Hilliard's guys had to delay the brewing to keep up with the demand for its Seahawks tribute pale ale, The 12th Can. Also, Fremont Mischief is mixing a winter cocktail called Smash No. 9 with its Workers No. 9 vodka, muddled cranberries, allspice, Rachel's Ginger Beer, and lime. The area will be set up with covered areas and heaters aplenty, so rain or cold, it should be nice, dry, and toasty. Plus after a high-ABV beer flight or two you’ll be feeling just fine. Which also means the Santa photo booth is going to have some interesting holiday snapshots. Proceeds go to support The World is Fun—a local non-profit. Winter Feast starts at 10am and continues throughout the day until 4pm. Keep tabs on the Mobile Food Rodeo Facebook page for updates, but here's the full list of participating trucks.